Book Review: 'Spies of No Country' Offers Nuanced Understanding Of Israel's Complexity For half a decade, Matti Friedman has been working hard, and publicly, to dispel easy narratives about Israel. In his book about four spies, he aims to show that Israel is "more than one thing." My grandfather was too young to serve in World War II. He watched from Bridgeport, Conn. as Hitler, then Stalin, murdered unspeakable numbers of Jews, including most of his family. The helplessness and guilt he felt underpinned his lifelong Zionism. He believed, unshakably, that Jews needed a place of refuge. Stories like his are common, and easy to empathize with. I imagine that the Israeli Canadian writer Matti Friedman would empathize. Then he would say, without ceremony, that my grandfather's version of Zionism is done. For half a decade, Friedman has been working hard, and publicly, to dispel easy narratives about Israel. He rose to attention — and controversy — through a pair of essays about media bias in coverage of Israel, and has remained on the beat ever since. His perspective is unusual: Israeli by choice, he clarifies his own bias in every piece but he writes to complicate, not to defend. 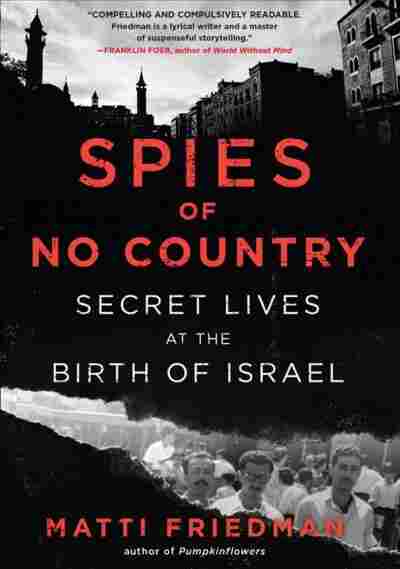 In his third book, Spies of No Country: Secret Lives at the Birth of Israel, Friedman rejects the narrative of Israel as a country filled with Europeans and their descendants, motivated by memories and guilt like my grandfather's. And he does it through a spy story. Spies of No Country focuses on a fledgling Israeli intelligence unit called the Arab Section, and on four of its spies. The Arab Section emerged at the tail end of British colonialism, at a moment when the Palestine was filling with Jews. The British had made hazy promises, but none clear enough to prevent the war that ensued. The Jews in Palestine formed an army, which in turn formed the Arab Section, a fledgling espionage operation easiest to understand as a version of the Soviets' Directorate S. Where the USSR trained Russians to live in America, though, the Arab Section did something much murkier. It trained Middle Eastern Jews to embed themselves in the very countries they were from. Friedman builds his story around four such Jews: Gamliel Cohen, Havakuk Cohen, Isaac Shoshan, and Yakuba Cohen. (None of the Cohens were related.) All four were native Arabic speakers. Yakuba grew up in Palestine, Havakuk in Yemen, and Gamliel and Isaac in Syria. In present-day Israeli parlance, they were Mizrahi. In the parlance of the Arab Section, they were not spies but mista'arvim, a word Friedman often uses in its full English translation: Ones Who Become Like Arabs. But it's hard to parse what made them like Arabs. "They were native to the Arab world," Friedman writes, "as native as Arabs. If the key to belonging to the Arabic nation was the Arabic language, as the Arab nationalists claimed, they were inside. So were they really...pretending to be Arabs, or were they pretending to be people who weren't Arabs pretending to be Arabs?" The question is unanswerable, but it's far more important to Spies of No Country than any spying the four men do in the book. In the time Friedman writes about, they lived in Beirut, running a corner store and driving taxis. "Their position," he explains, "was like that of Russian agents tasked with gleaning intelligence not from Capitol Hill or Wall Street but from the sidewalk outside a public school in Queens." Imagine watching The Americans with no missions or violence. It would be a show about two travel agents' marriage. A show with spies in it, not a spy show. Spies of No Country is a book with spies in it, not a spy book. Friedman chose the Arab Section to prove a point. My grandfather believed in Israel as a place of refuge for European Jews, but for Jews like Gamliel, Havakuk, Isaac, and Yakuba, it was more complex than that. Yakuba had no other homeland. Gamliel, Havakuk, and Isaac only had homelands outside Israel if they were Arabs, and yet Jewish and Arab identity have always been considered mutually exclusive — which is why they emigrated to Israel. They weren't alone. After 1948, Israel filled with Middle Eastern Jews. Today, nearly 53 percent of Israeli Jews have roots in the Arab world. To Friedman, understanding that fact is crucial to understanding Israel. "The complicated identities of [the spies], their stories concealing other stories — here's a window into the complicated identity of this country, and into the stories beneath the stories it tells about itself." Spies of No Country is an important book for that reason. Americans are not accustomed to hearing about Israel's complexity, or its diversity. We are rarely asked to consider Israel as a country that is, as Friedman says, "more than one thing." Any serious defender or critic of Israeli politics should consider this a serious problem. Meaningful opinions require nuanced understanding, and Spies of No Country offers that. Even my grandfather, I think, would agree.